FROM CHEMISTRY TO HISTORY, the College of Arts & Sciences provides education abroad opportunities for every major, including study, research, service and teaching activities. Students can choose from among 14 faculty-led programs in a wide range of subject areas and locations. 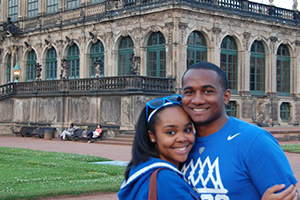 Through generous donor involvement and investment, A&S students are able to ease the financial burden of studying abroad through travel grants such as the Trunzo Scholars Program and Zolondek Scholarships. The Trunzo Scholars Program began this past summer and allowed seven College of Arts & Sciences students to participate in education abroad or professional internship opportunities. Established by Robert N. (Political Science ’78) and Anne Trunzo of Brookfield, Wis., the Trunzo Scholars Program was designed to help political science and pre-law students expand their academic and professional horizons through education abroad and internship opportunities. The first class of Trunzo Scholars included students who spent the summer interning in areas of politics, government, law, or public policy and in education abroad programs based in South Africa, Morocco and Spain, England and Peru. The Zolondek Holocaust Scholarship awards scholarships for students to visit Paris, Amsterdam/Haarlem, Berlin and two other European cities and sites related to the Holocaust. 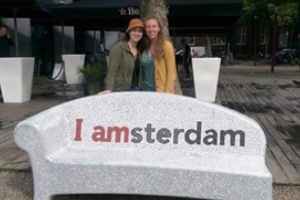 The Winter Break Scholarship allows students to travel to London, Paris and Berlin, and the European Studies Scholarship awards students the ability to independently study a theme over the summer as they travel to specific areas in Europe. What made my experience unique was not only increasing my understanding of Spain's history but also learning to be independent and navigating a new environment. I learned to rely on myself and react positively in di cult situations. I learned how to navigate a foreign country completely on my own. I was able to meet amazing people who were doing some pretty incredible things with their experiences abroad. Aside from expanding my educational experience, I truly learned more about the kind of person I am and want to be. I took a course on the history of South Africa prior to departing on my trip, so visiting the places I read about in textbooks, such as Nelson Mandela’s jail cell on Robben Island, was surreal. The summer I spent interning in South Africa only con rmed my desire to pursue a career in the legal eld ghting for human rights. I believe that my education abroad experience will greatly expand and increase my classroom learning. I have gained a lot of con dence from the knowledge that the education I have received here at UK has prepared me well to compete with students from other universities. This trip made me step out of what I was comfortable doing. Having to plan the entire trip, be trusted with all the money, and at the same time be exposed to such heavy material at the di erent memorials and museums, was an experience I'll never forget. I learned so much and the things that I learned I will take with me wherever I go. Want to help UK students take on the world? 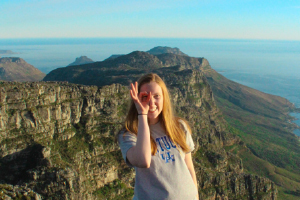 For more information about the Arts & Sciences International Education Abroad Fund, contact Laurel Hostetter at (859) 218-5551 or laurel.hostetter@uky.edu.